Women continue to reign as a symbol of strength in the Jeju community. The Haenyeo, notable for their physical agility in water and pride on land, are one example, and then there is Kim Man-deok, perhaps Jeju’s most famous woman, whose strength is noted in providing for the less fortunate. Difficult times are cyclical, and the world is yet again at the mercy of a global recession. In an attempt to defeat poverty, South Korean President Lee Myung-bak is pin-pointing Kim Man-deok as an example to live by. It was she that at one time exhausted her personal fortune, in order to purchase enough rice to feed the people of Jeju Island. According to the United Nations Food and Agriculture Organization, the number of starving people in the world rose to 1.02 billion this year. The UN attributed the hunger of 100 million of those individuals to the global financial recession. Need has increased because of high domestic food prices, lower incomes and increased unemployment—leaving people unable to purchase the food they need. The United Nations designated Oct. 17th as the International Day for the Eradication of Poverty. 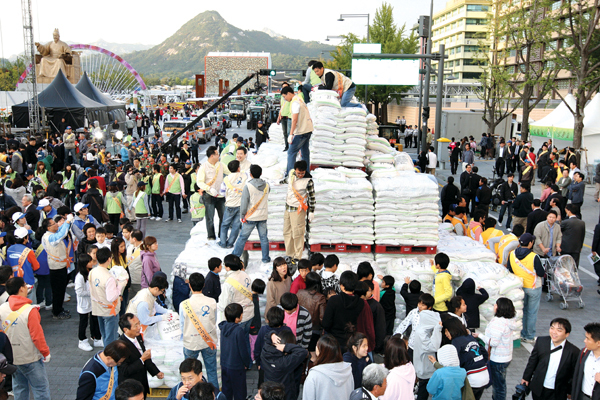 The Kim Man-deok Foundation was successful in the collection of 22,000 sacks of rice at the Oct. 18 event. Jeju news provider Jejusori, reports that 12,000 sacks will go to the needy in Korea and the remaining amount to children living in Africa. Jeju Island has also established the Man-doek Award, a yearly prize given to two ladies of outstanding conduct. The 2008 awards went to volunteer Han Wol-ja, 58, who lives in Jeju-si. Her work includes volunteering at welfare facilities, financially supporting heating for low-income families, and taking care of orphans. She has dedicated 25 years of her life to bettering the lives of others. The second award was given to an outstanding business woman Yoo Yang-sun, 75, who is from Gyeonggi Province. Yoo donated 1.8 million dollars- the majority of her life savings, to Hanseo University. She also established a scholarship foundation to provide educational opportunities for those with financial difficulties. The winners of the 2009 Man-deok Award are yet to be determined.